The world's most trusted grammar source for clear, direct, and comprehensive instruction, the Azar-Hagen Grammar Series – including Fundamentals of English Grammar for lower-intermediate and intermediate English language learners – blends grammar instruction with communicative methods. 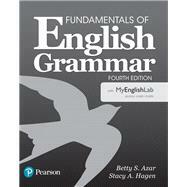 Grammar is the springboard for developing all language skills: speaking, listening, reading, and writing. With clear, user-friendly charts and engaging, interactive practice, it's easy to see why this classic series remains the top-selling text in its field year after year. Examples accompanied by easy-to-understand explanations and minimal terminology. Immediate application of grammatical forms and meanings. Variety of exercise types including warm-up, reading, listening, comprehension, completion, interview, and writing. Written vs. spoken usage in formal and informal contexts. Teacher's Guide includes step-by-step teaching suggestions for each chart, notes on key grammar structures, and vocabulary and expansion activities. Test Bank offers additional quizzes, chapter tests, mid-term, and final exams, and Chart Book contains the grammar charts. Teachers can use the eText as a classroom presentation tool and the ExamView® software to customize their tests. Extensive grammar practice with more than 500 new interactive exercises for practice in listening, speaking, and reading. Learner support with pop-up notes and grammar charts for easy access to information. Ongoing assessment, with immediate feedback on practice activities and tests, so students can monitor their own progress.